Oh, yeah. You heard me. And if you know me at all, you know that I really don’t like going to the mall (although looking for that old post spun me into a nostalgic rabbit hole of remembering shopping for M’s 5th grade Moving Up Ceremony dress, which seems a million years away after shopping for prom dresses last week). But in spite of my usual hesitation, I happily agreed to take J and a couple of friends to the mall because that girl needs some pure fun in her life. It really didn’t seem worth it to schlep all the way home just to come back and drive them all back later — especially since I probably dislike driving even more than being at the mall — so I packed my laptop and a magazine to while away my spare time. I dropped the girls right at the door so that they could maximize their mall time while I minimized mine. As soon as I walked in, I began to regret the whole outing. I don’t love the mall on a Wednesday morning. But a Saturday afternoon when the weather’s cold? Ugh, it was like pre-Christmas shopping, but without the holiday cheer. Actually, the place wasn’t entirely devoid of cheer because it was the annual ESYO Playathon, and witnessing that made me happy because it’s an event I’ve always strongly supported in theory (free, cultural, family-friendly, hands-on) without ever actually going. Now I can say I’ve gone. But also, it just increased the crowds, and I wasn’t entirely sure I could handle spending hours at the mall. So I got the brainstorm that I should check and see if the gods had smiled on me with a movie I’d like to see. The gods didn’t smile. After hustling my way across the length of the mall and squinting at the electronic billboard that flashed so quickly I started to feel downright elderly, I determined that no movies I wanted to see were starting soon enough for me to squeeze in a viewing while the girls ambled around. Sigh. Then I remembered my dire need for winter boots. A week or so ago, my winter snow boots split between the sole and the heel. It was a critical breech to experience during the polar vortex, and every time I wore the shoes anyway (because I had nothing better to wear), they’d rip a little more when I’d pull them off. As luck would have it, all the boots were on sale at Famous Footwear–whoop, whoop! I was able to find a serviceable pair of replacement boots pretty quickly. And then, well, I don’t want to be too dramatic or anything about it, but. . .
one of my wildest and most wonderful fantasies came true. 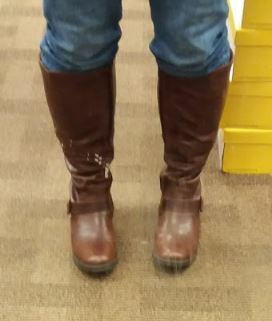 Knee-high boots that I can actually wear! What, your fantasies are more interesting? Whatever. Okay, first, I’ve always got a thing about brown boots, especially with rounded toes. I have short, squat little feet, so the pointy-toed shoes and boots that seem to have been popular for, oh, 85% of my life time are just not my cup of tea. Whenever a trend comes back in that involves rounded toes, I rejoice. But back to the general brown boot obsession: I distinctly remember one of my most-beloved pairs of boots from high school that I wore until they were basically torn apart and my mother threw them in the trash in disgust and I went outside and dug them out of a garbage can just so that I could tuck them into my closet for purely nostalgic purposes. But, more recently, these boots that are tall, almost to the knee, have been popular. At first, I found these really irritating, but my fondness grew and grew until I began to find them practically irresistible (this is so much like my courtship story!) Sadly, though, I had to resist them, because for the life of me I couldn’t find a pair of boots under $300 that would zip over my calves. My powerful, Wonder Woman calves cannot be contained by mainstream fashion. I feel like I’m always seeing all sorts of casual-but-stylish moms wearing cute sweaters and skinny jeans and knee-high boots — at sports tournaments you can count a dozen of them, easy — and whenever I encounter these women, a piece of my soul freezes into a rigid green shard of envy and bitterness that breaks off and shatters. Which I understand is ridiculous. I have an excellent life and much for which I am entirely grateful. And it’s quite possible that these fabulous boot-wearing ladies have all sorts of other impediments to joy: horrible husbands, deeply challenged children, unwieldy credit card debt, and/or a heavy reliance on pharmaceutical assistance. I try to sympathetically imagine a complicated existence that is mitigated by the small blessing of bodily and fashion perfection. I try to see it. . . but all I can see is those fabulous boots! So, how did this Miracle of the Mall happen? How was I able to wear a pair of boots that would fit my short little feet and my body-builder calf muscles? Why, every curvy girl’s favorite: the corset! Okay, yes, perhaps the backs remind me a teensy bit of an old-timey, Wild West Bordello, but turns out: I. Don’t. Care. 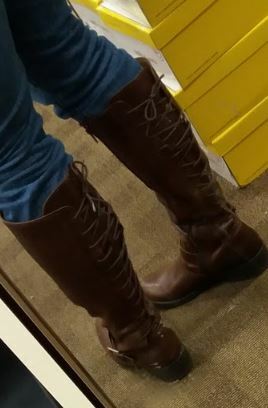 I actually don’t really see the back of my boots unless I’m craning over my shoulder at the shoe store trying to take a photo to share with you. The crucial fact is: I can wear some brown boots with rounded toes that go all the way up to my knees, even over a pair of jeans. Not only that: the boots were marked down by about 65%, so they were a fabulous bargain! I firmly believe that this was a karmic reward for sacrificing a Saturday afternoon to generously provide rides to and from the mall. And I bet you can guess what I wore to the Sunday track meet! Ugh, I dislike shopping under the best of circumstances, and unfortunately I had to go to Clifton Park Center this past Saturday. I’m glad your purchase worked out!